The decision has been made to take your business overseas, and you’re all set to sell abroad… however, how can people find your website? When entering a new market, you will be faced with local competitors who will most likely have an established brand presence. To compete successfully, your website needs to be visible for relevant keywords and present your audience with user-friendly content. In order to achieve this visibility, a strategic approach to technical SEO is needed. Implementing technical SEO for international markets is hard. Our webinar aims to simplify the process and give guidance on how to avoid the most common mistakes. A successful international SEO campaign requires the same technical expertise needed for a domestic campaign, alongside language and cultural knowledge of your target market. There is a whole host of considerations when planning your online expansion and technical SEO needs to be considered right at the start of a new website build. We’ve helped a wealth of clients across different sectors take their businesses global online, and we want to share our expertise with you. 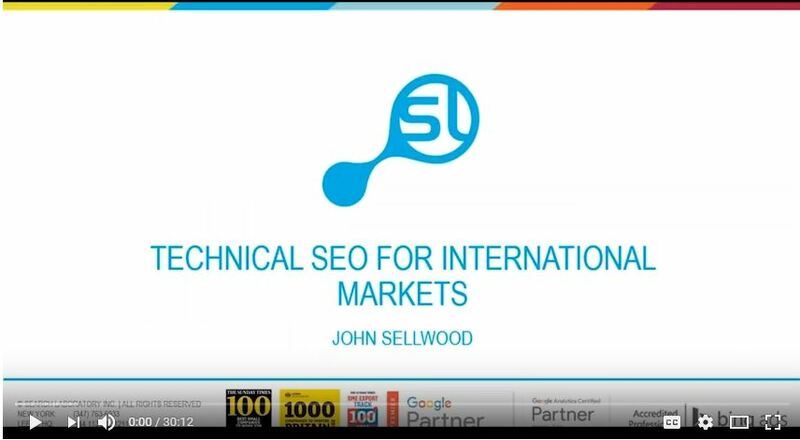 Our VP of Sales, John Sellwood, will take you through the key steps you need to take when planning your international technical SEO strategy. John has over a decade of digital experience, holding senior posts in agencies and client-side in the financial services sector. Much of his career has focused on the internationalization of digital activity, and it is this focus which has brought John to Search Laboratory as VP Sales in New York. John works directly with brands across the US and Canada to help them create the right digital strategy for effective international expansion.